Golden-139 Multi Function Banknote Detector, adopting advanced technology and integrating equipment with Long-ware UV Short-ware UV, watermark, magnetism, magnifier. It has the latest design to avoid your eye expose directly to the ultraviolet light because it will damage your eyes. Furthermore the function is complete, accurate detection and convenient use. Therefore it is a good detecting assistant. It enjoys good feedback from end-users So, it is a kind of ideal machine for detecting banknotes and bill in financial departments and any shopping arcades. Accurate detection and easy operating. Freely exchange for the watermark and ultraviolet detection. Equipped with watermark verification window and a magnetic detection device, to further increase bill or document analysis capability. With alarm indicating lamp and light when magnetic detecting. 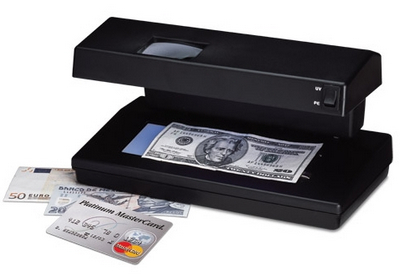 Includes a large built-in magnifying lens for micro-printing verification. Adopts two advanced UV tubes. Specifically designed to protect the user from direct eye exposure to the UV rays. 2x6 watts UV on top and 1x4 watts white lamp is under.